Janmashtami is just around the corner, and devotees across the world are gearing to welcome the eight avatar of Lord Vishnu- Lord Krishna with much enthusiasm and fervor. Krishna, Kanhaiya, Govind, Gopal, Nandlal, Brijesh, Manmohan, Balgopal, Murli Manohar… No matter what you call him Lord Krishna spreads love and harmony amid circumstances of conflict and chaos. There are numerous stories that are recited till today about the many mischief of little Krishna and how he got to be known as the ‘makhan chor’, for his love for white butter. Janmashtami marks the birthday of Lord Krishna, and is celebrated with much fervour every year. It is one of the major festivals in the Indian calendar, and Hindus consider this day auspicious. They patiently wait for Janmashtami every year, and follow many customs to show their devotion to Krishna ji. Though different regions carry out Janmashtami celebrations in their own way, most people fast the entire day. After sundown, hymns are recited and bhajans are sung in the name of the Lord. People stay up till midnight to break their fast, as it is believed to be the time when Lord Krishna was born. The day after Janmashtami is referred to as ‘Nanda Utsav’, wherein people distribute sweets and gifts to their loved ones. As an offering to the Lord, people put together a list of 56 food items, referred to as the Chappan Bhog. The word ‘Chappan’ translated to 56, and ‘Bhog’ means food. Wondering why there are specifically 56 items? The story goes that to protect his village and the people from the wrath of The God of Rain (Lord Indra), Krishna ji had lifted the Govardhan Parvat and placed it at the tip of his little finger, under which everyone had taken refuge. He stood still for seven whole days continuously, until Lord Indra realised his mistake. Lord Krishna would usually eat eight food items every day, but he didn’t consume any food during these seven days. So at the end of the seventh day, everyone made Krishna ji a total of 56 dishes (eight multiplied by seven), out of gratitude. As legend had it, it consists of Lord Krishna’s favourite dishes and usually includes cereal, fruits, dry fruits, sweets, drinks, namkeen and pickles in quantities of seven under each category. There are also variations wherein some people offer 16 kinds of namkeen, 20 kinds of sweets and 20 kinds of dry fruits. Some of the common items found in the Chappan Bhog are makhan mishri, kheer, rasgulla, jeera ladoo, jalebi, rabri, mathri, malpua, mohanbhog, chutney, murabba, saag, dahi, rice, dal, kadi, ghewar, chila, papad, moong dal ka halwa, pakoda, khichadi, brinjal ka sabji, lauki ka sabji, poori, badam milk, tikkis, cashews, almonds, pistachios, and elachi among others. 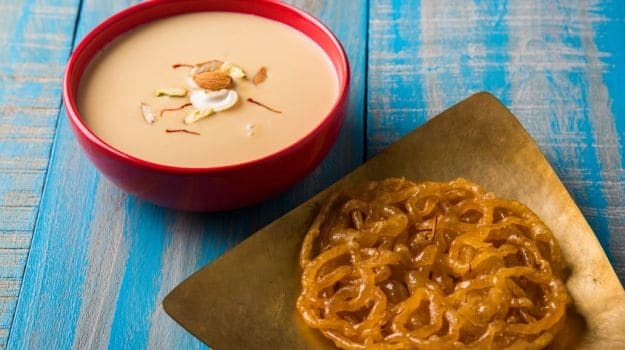 The bhog is traditionally arranged in a particular sequence, starting with milk items, moving on the besan-based treats and salty food, and ending with sweets, dry fruits and cardamom. The food is first offered to Krishna ji, and then distributed among all the devotees and priests.